To begin, a new CI has draft status. Any field changes don't change this status status. All changes are saved automatically, and validations are switched off. When User clicks on "Publish", all CI's fields will be validated. If the validation was succesfull, CI's status becomes published. If not, error messages will be shown, and status remains draft. When User makes any changes, CI's status will change to updated. 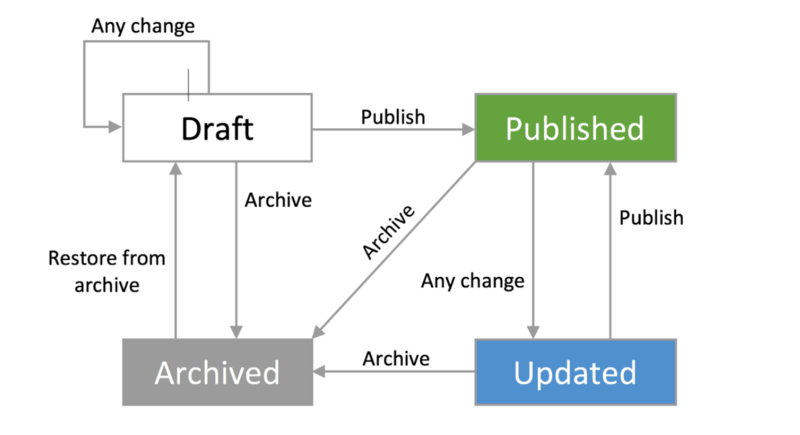 Like in a draft, all changes will be saved automatically without validations. To publish changes, user should click on "Publish"; then validation will run and publication process as above. User can archive CI from any status. Archived CIs are read only. When user restores CI from archive, CI will get draft status again. User can delete CI only if it has archived status. The database status is kept in a t__status field. After publication there are two records in a database for this CI — one has published or updated status and keeps old data, another has draft status and keeps new data.